Crime, cryptograms, and killer conundrums abound for the Puzzle Lady in the fourth installment of the series USA Today raves is "a fun series for mystery fans and cruciverbalists!" 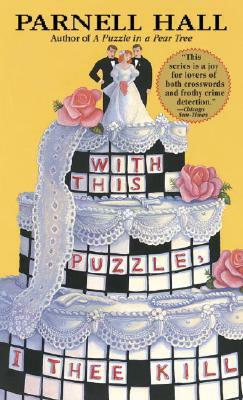 It looks like wedding bells again for the much-married Cora Felton when distinguished widower Raymond Harstein III moves into town and makes a play for the Puzzle Lady. That is, it does until the mail brings puzzling cryptograms, which, when deciphered, warn Cora off the match. As the puzzles keep coming, a killer's game must be played in earnest, and it's up to the Puzzle Lady to solve the riddle--if anyone is going to live to make it to the altar!